With careful planning and consideration, planning a backyard patio design as impressive as the inside of your house can be simple. By planning out a decent sized space with the best patio furniture and accessories, having a stylish and fun dream patio can be achieved by almost anyone. I would say at least 90% of the patios built, are connected to the home. With this in mind you will need to take sun and shade that you already have into consideration. Since you wont want intense sun rays beating down on you when you are trying to relax outside. If your site doesn't have any shade producing trees, you can always add small patio trees, a pergola or there is an array of patio covers and patio umbrellas you could add for shade. Just like a home with a view a patio is no different, if your property already has a great view your in luck. More often than not your patio view will be your neighbors backyard, or worse even yet a wood fence. If that is your case you can landscape around your patio by adding some landscaping shrubs and patio trees once your backyard patio is finished, since they can brighten up the overall atmosphere. You might also consider adding a outdoor garden water fountain or a patio water garden to your patio. Nothing is worse than building a patio that is to small for your needs. If you already have your furniture you will be using for your patio, take it outside and set it up to determine how much room you will need. Make sure to always allow for extra room, since you would rather have more room than less. A good rule of thumb when placing furniture near the edges of the patio, is to allow at least 16 inches. You also need consider any patio accessories that you will be putting on the patio. Such as an outdoor heater, patio fire pit or BBQ grill. If your patio consists of an outdoor kitchen, hot tub or an built in outdoor fireplace you may want to consider including two patios, or one connected patio that is separated by different levels. 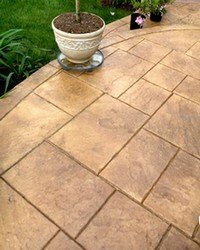 The next item to think about when planning your backyard patio design is the material that you wish to use. A more basic patio should work with a concrete floor, which can be spruced up with some brick edging or by staining it a different color. Stone veneer is another great option for a patio, since it gives the look of real stone but will cost much less. Brick is also widely used for outdoor patios, and it can give your patio a classic and traditional look. No matter what material you like, make sure you think about how it will look up against your home. You may want to avoid brick if you home already includes brick, and some tile looks better up against stucco rather than wood. 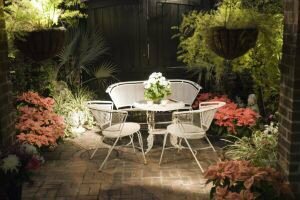 An open patio is usually the easiest to plan out, since they dont require any obstructions. These types of patio's are best suited for the person that enjoys the sun and the breeze. An enclosed patio or patio room, are great for a more controlled enviroment all year long. If your backyard size and budget will allow it you might consider also adding a open patio and wood deck so you can the best of both patio's. Patio's that are built directly next to a house are great for adding a cover of some type which will protect you from the sun or any unclimate weather. A good idea is to build the patio big enough that you can cover part of it and leave the rest open. The possibilities are really endless when it comes to planning your backyard patio design, and there really isnt a right or wrong way to do it. Go with what you think looks good and even ask for input from family or friends. A patio is a great place to spend time with your friends and family, or even relax on your own after a long day of work. Have fun and enjoy your patio since you created it!